1930 to September 11, 2001, Revised Edition. 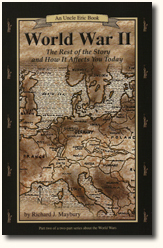 Mr. Maybury's book, World War II, focuses on ideas and events in the Second World War and how they affect us today. Mr. Maybury explains, "The most important parts of World War II were how the U.S. got into it, the way the war was conducted, and the ideas that emerged from it. These set the stage for the world we live in today. The misunderstandings about World War II created a chain reaction, or domino effect, that led to America's subsequent wars, including the Korean War and Vietnam War, the Iraq-Kuwait War, and the 'War on Terror' that began September 11, 2001."